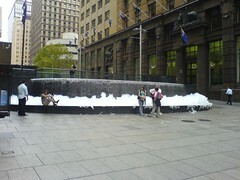 Just walked through Martin Place and saw some foam floating by. Someone put detergent in the fountain and it has foamed up Jerry!! Some people were taking advantage and enjoying the bubbles. Others had a much needed wash. 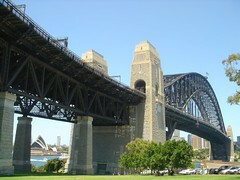 Took some pics on Friday night and Saturday morning whilst at North Sydney. This is one of my favourites. Went to Luna Park after an amazing dining experience at Aqua Dining. It was so much fun. I even got suckered in to shooting some hoops for stuffed toys. Missed the first two but redeemed myself on the last one to win a slightly strange teddy bear. Ferris Wheel was great too. 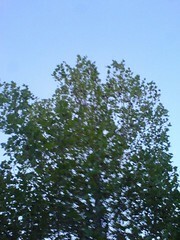 Last night in Hornsby, I saw a tree with more than 100 grass parrots. It was loud, but beautiful. I thought of 'The Birds'. Which I've never seen, but you know. I did see Psycho for the first time on the weekend. I liked it. Good suspense. Thanks KC!!!! 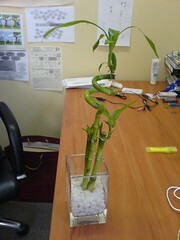 A funky addition to my already crowded desk. Here is a listing on boing boing of a watch that would suit me. Wayne, if you're watching you might remember a D-Gen skit on this. A motorist gets angry and takes on a lady bike rider. I'm not exactly sure what happened, but I think he threw something out his window, then she threw it back in, so he lost it and came after her, then he left, then he came back and tried to get her again. And in Canadia of all places. Originally uploaded by S = k log w.
So my friend needs to take his girlfriend out for her birthday. Can anyone recommend a good restaurant in Bondi or a great steak restaurant in the city or Bondi? Where are you Fabo Fabo??? 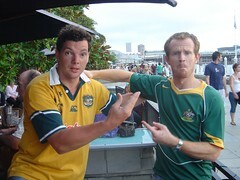 Great Australia Day had despite working most of it. Darling Harbour was a buzz, and even though I had my usual "Fireworks are LAME!!!" hat on, they were actually quite good. I think they could have played Down Under and the crowd would have danced. Cheers to KC, Caine, Jess, Sarah, Chris and Helen for beers on Harbour. Congrats to George for being best dressed in a pair of small red shorts. Cheers to DK for lunch at Doyles. P.S. I think you should be proud of all the things that you're apart of. Your family, your team, your street, your neighbourhood, your town, your state, your country, your planet and your universe. Be proud of yours, but not at the detriment of others. Be great, but don't worry about being best. Originally uploaded by The Wolf. So, I'm working, but hopefully only till about 3pm? Then it's down to the rocks to watch the Tall Ships sail into the harbour. Do you Aussies feel more patriotic on Australia Day or ANZAC Day?